When Doug John launched Apocalypse Ale Works in Forest five years ago, he started with four beers that he hoped would be distinctive. “I swore that I would never make an IPA until hell froze over,” he said. After hearing from many hop lovers, he gave in last year, and now that IPA, called “Hells Frozen,” is his best seller. “It just shows, never say never,” John said. As the craft beer explosion continues, there are not only an increasing number of great beers, but there are also more breweries struggling to carve out a niche in a crowded market. A new report by the Brewers Association—a trade association representing small and independent American craft brewers—showed that craft brewers saw a 5 percent rise in production volume in 2017, but also a 42 percent jump in closure of small craft breweries, up from 116 in 2016 to nearly 1,000 in 2017. John said the secret to success is being nimble, being willing to try new things and keeping the quality up. John’s award-winning beers are sold throughout Virginia, with 70 percent of sales on tap and the remainder packaged in cans and bottles. A family business, Apocalypse is owned by John, his wife Lee, and son Austin. Until they are debt-free, John says they will not expand beyond Virginia, but they hope that day will come. One of their newest additions on draft isn’t really a beer. Triad Hard Seltzer Water is a low carb, low-calorie, gluten-free alternative, particularly popular among women. John has also discovered that providing food or allowing customers to bring their own is critical. A local food truck, Randy’s Sweet Pig, is now at Apocalypse 90 percent of the time. John got started in the beer business in 1995, just next door to Apocalypse, where his Pints ’O Plenty offers home brewing kits, but also 600 different beers, including 60 brewed in Virginia. “I do feel like there’s always going to be room for local breweries as long as they are high quality,” he said. One of the newer competitors is former customer Derin Foor, owner of Loose Shoe Brewing in Amherst. He started home brewing with a kit from Pints ’O Plenty, and three years ago, launched his own line of beers. Loose Shoe’s bestseller is a double IPA dubbed Insidious, which Foor says has captivated an audience. With a 12-tap system, Foor keeps six constant and uses the other six to rotate through his 42 different beers. Business is going well, Foor said, with not only local traffic, but also a “tremendous number of people coming out of North Carolina.” Tourists like the area, and they like to drink beer, Foor said. 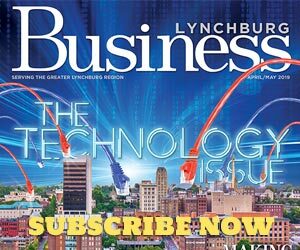 Anna Bentson, assistant director of Lynchburg’s Office of Economic Development and Tourism, agrees. “Local breweries offer authentic experiences that many visitors seek out as destinations when traveling,” she said. “As small businesses, they also provide natural community gathering spaces and spur economic growth. The Central Virginia market is definitely expanding. Loose Shoe will soon lose the distinction of being the only brewery in Amherst County. By July or August, the former Amherst Milling Company will be transformed not only into a brewery, but also a social experience says owner, Dave McCormack, of Petersburg-based Waukeshaw Development, Inc. Already they are working on creating wild beers made from yeast harvested on the property, where two acres of vegetables and fruits will be planted. McCormack said he wants to ensure patrons realize they are stepping into an early- 1900s mill when they visit. He would like to repurpose the wheel, which might make the brewery the only hydro-powered one in the U.S.
Waukeshaw Development will also use the former mill as an outpost for its existing Trapezium Brewing Co., based in Petersburg. McCormack said the 27-acre property and another 60 acres he has purchased in Amherst County will be called Camp Trapezium. In addition to brewing beer, they will serve brick-oven pizza. In June 2017, the company also opened Beale’s Brewery, a 16,000-square-foot facility in Bedford, which McCormack says has exceeded expectations. While craft beers are popular, they make up only 13 percent of the beer market, so McCormack said they knew people still like lighter lagers. His brewmaster, James Frazer, created one that struck gold. Beale’s Gold is their best seller and is already being distributed in Lynchburg and Richmond. 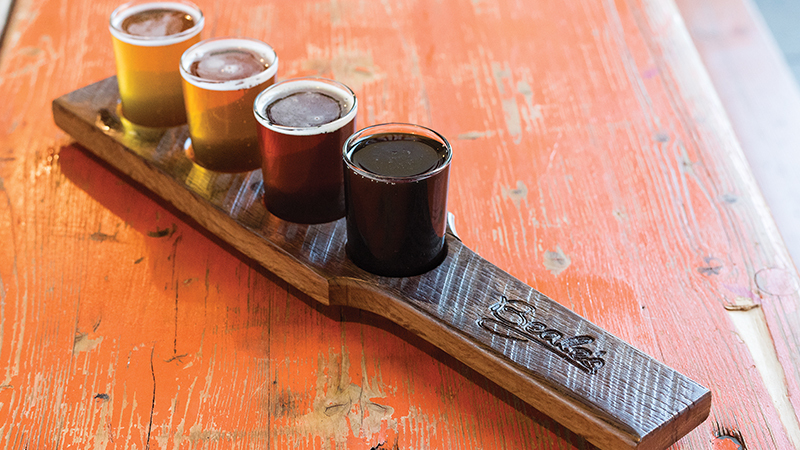 The craft brewing industry began in earnest in the late 1970s and early 1980s and has seen a resurgence in the past decade, but small craft breweries compete among themselves for taps at restaurants and shelf space at retailers. They are also up against massive industrial brewers that wield heavy influence over the national distribution of beer and often buy up smaller companies. Devils Backbone Brewing Company in Roseland is an example of a small brewery that attracted a giant. Established in 2008, the popular brewery was acquired by Anheuser-Busch in 2016. Its beer is now sold throughout the Southeast and beyond. Just down the road in Afton is Blue Mountain Brewery, which opened in 2007 as the first brewery in Nelson County. All their ales and lagers are brewed, bottled, canned and kegged onsite in Afton or in Arrington at their Blue Mountain Barrel House. The two breweries will craft 10,000 barrels (310,000 gallons) of beer this year. Many restaurants are offering local brews and some even have a “house beer.” At Fifth & Federal Station, owner Josh Read collaborated with Chaos in Calloway, Va., to have a beer that fit its whiskey bar theme. Chaos Federal Reserve has been immensely popular, Read said, and Chaos plans to bottle it for distribution in June. With more than 6,300 breweries operating in the United States in 2017, small and independent brewers produced 25.4 million barrels in 2017, with an estimated $26 billion retail value, according to the Brewers Association. Over much of the past decade the industry’s growth rate held at double digits, peaking at 18 percent growth in 2013 and 2014. 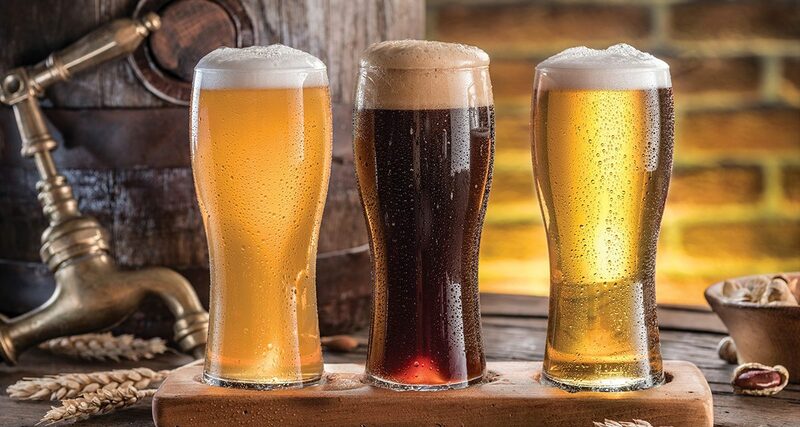 The total beer market went down 1 percent by volume in 2017, a decrease in about 2.4 million barrels from the previous year. Local brewers, however, are confident they are in the right place.